I am going to go out on a ledge and guess there were plenty of actors who could play a physically attractive Pacific Islander. Apparently Hollywood can't find one. Some guy named Zach McGowan has been cast as Hawaiian native Benehakaka “Ben” Kanahele in an upcoming WWII film entitled Ni’ihau. Apparently Ol' Ben Kanahele was not a blue-eyed, white skinned person of non-Hawaiian origin. 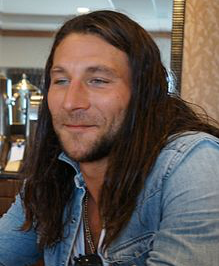 Actor Zach McGowan has been cast as Hawaiian native Benehakaka “Ben” Kanahele in the upcoming WWII film “Ni’ihau,” reigniting the “whitewashing” controversy in Hollywood where Asian/Pacific Islanders are portrayed by white actors. The film chronicles the true story of the Ni’ihau Incident, in which Kanahele rescued Shigenori Nishikaichi, an Imperial Japanese Navy Air Service pilot who participated in the bombing of Pearl Harbor, after he crashed his plane onto the Hawaii island of Ni’ihau. After Nishikaichi escaped and banded with three local Japanese to terrorize American locals, Kanahele and his wife ultimately killed him. Kanahele, who was shot by Nishikaichi, was later hailed by the U.S. government as a hero for helping prevent a takeover on the island. The incident — as well as systemic racism against Asian Americans at the time — prompted President Franklin D. Roosevelt to issue an executive order placing thousands of Japanese-Americans in internment camps, widely regarded as one of the darkest hours in U.S. history. McGowan, who has appeared in “Shameless” and “Black Sails” as English pirate Charles Vane, is Caucasian with brown hair and blue eyes. Kanahele was a native Hawaiian with brown skin and dark hair. McGowan’s casting is the latest in a series of “whitewashed” roles.